Chef Kevin Sousa is again on the rise with his new restaurant in Braddock. Veal crowned with apple slices. From early times humans have gathered along the banks of the Monongahela River in Braddock: native people, early settlers, a namesake English general and his young aide who would become U.S. president No.1, a steel magnate, and now noted Chef Kevin Sousa. Sousa is attempting a phoenix-like return to the Pittsburgh dining scene with his new restaurant, Superior Motors. He is known for his East End trio of Salt of the Earth, Union Pig and Chicken, and Station Street Hot Dogs. All have been closed for several years now. Sousa sold his part of Salt of the Earth to his partner after continuing friction between them. He sold Union Pig and Chicken to a group of his employees. After a several year build-out Superior Motors opened in July in Braddock directly across the street from the sprawling Edgar Thomson Plant of United States Steel’s Mon Valley Works. Chef Sousa ready to place the next ingredient on a dish. Sousa is known for being a chef who creates many interesting food offerings. Superior Motors does not feature oversized portions prepared the standard way. What it does offer is creative dishes prepared using some of the finest and freshest ingredients and plated in an aesthetically pleasing manner. During the growing season many of the vegetables used come from Braddock Farms, an urban farm plot. The restaurant is housed in the restored former location of a long-gone auto dealership called Superior Motors. A greenhouse will be built on the roof; additionally a farm plot will be developed and planted to the side of the building. The main dining room and bar area. The restaurant’s interior features beautiful brick walls. Art hangs on the walls and some great music is played. On recent visits music from Tom Petty, The Rolling Stones, and some jazz was heard. Superior Motors has a hidden music station for spinning albums and playing music in other formats. Tables are set in a casual manner with no tablecloths. For my first visit I dined with my friend Mike who was born and raised within sight of the Edgar Thomson Plant and whose father worked for U.S. Steel’s mill railroad, the Union Railroad. Upon entering Superior Motors I asked for a table near the large front windows and they accommodated our request. The table was at knee level and well suited for small plates and cocktails, not great however for a full meal. We decided to stick with it as there was still some daylight coming into the restaurant and that is best for taking photos. The menu was presented on a clipboard. Although limited it did offer some interesting choices including: foie gras, octopus, tartare, rigatoni with shrimp, venison, mushroom, beef, and pork. Chef Sousa said he doesn’t make wholesale changes to the menu but occasionally takes items off and adds new ones. We placed our order with our server (this may have been bar seating, as he was also making cocktails and other drinks). I ordered the sunchoke soup, octopus appetizer, and pork as my main. Since I was in Braddock I paired my dinner with a General Braddock’s IPA draft, which comes from the Brew Gentlemen brew pub in Braddock. Mike selected the rigatoni with shrimp. The soup was thick, smooth, and savory. 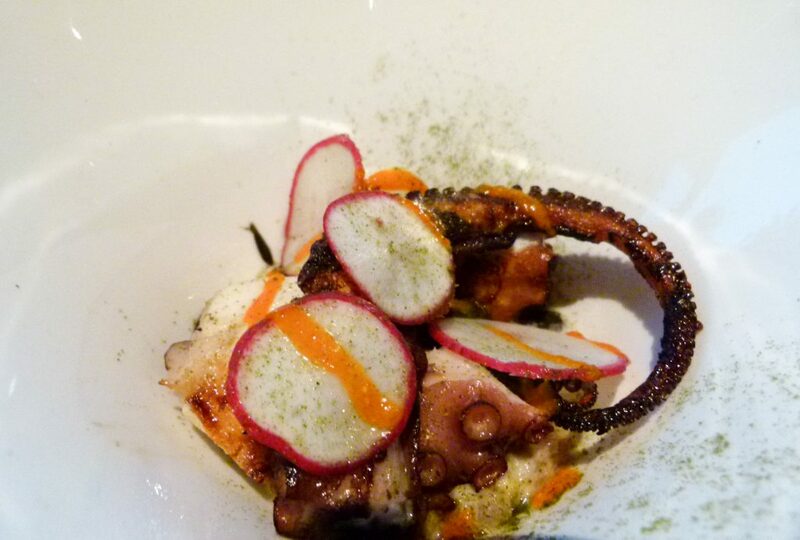 We both sampled the octopus which was served with nixtamal, jalapeño, huitlacoche, and some red radish slices. I wasn’t familiar with some of these ingredients. The server/bartender gave a basic explanation of them and I looked into them further on the web. Nixtamalization is a process that’s very popular in Mexico and increasingly so in the U.S. for the preparation of corn. The corn is soaked in an alkaline solution, often lime water. Through this process the corn is more easily ground and offers improved aroma, flavor, and nutritional benefits. Huitlacoche is the Mexican word for a fungus that grows on corn and has a truffle-like flavor. The octopus meat was char-grilled which imparted some good additional notes, and it was cooked just right. Pork; notice the trout roe on the right. The pork dish was composed of a few long strips of pork fillet served medium with dashi potatoes, Reggiano, and trout roe in a light gribiche sauce. The pork was tender and tasty, and the ingredients worked well together, even with the small servings of trout roe which flanked the main dish, like an adornment, but were not totally mixed in. The dish was served with a thin, crispy Reggiano cheese wafer on top. Mike enjoyed his taste of the pork dish very much. His rigatoni with shrimp was served with sassafras leaves on top and tomatoes in a light white sauce. The shrimp was of good size but just slightly overcooked. For dessert we split the pavlova (named after the Russian ballerina Anna Pavlova). This was a new one for me. 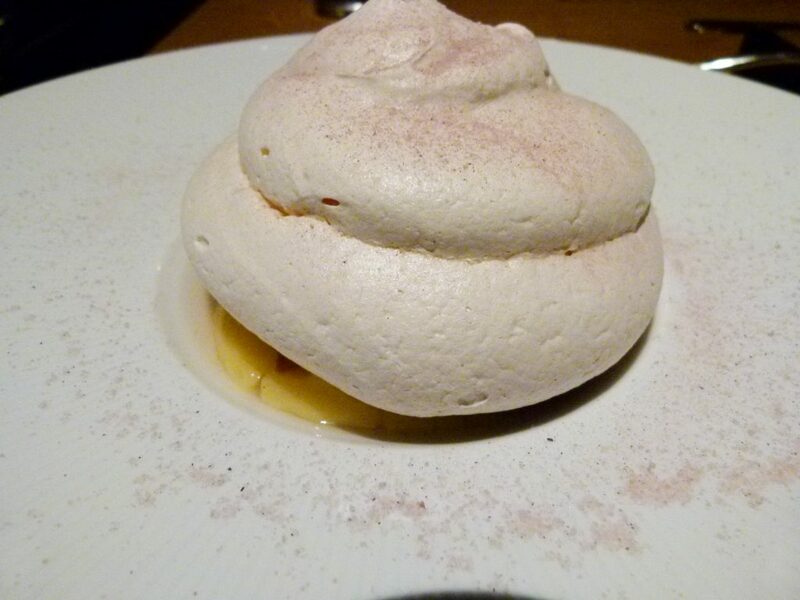 It was a crisp beige-colored meringue swirled dome on top of yuzu curd, stone fruit, and chrysanthemum. It was like a small round lemon meringue pie with crispy meringue instead of a soft and pillowy one. There was no bottom crust. There was more of the crispy dome than filling, but what filling was there was sweet and satisfying. On my second visit I popped in for an early dinner after a Steelers game. I ordered the tartare, which the friendly server said was tuna that evening, and the beef as my main. 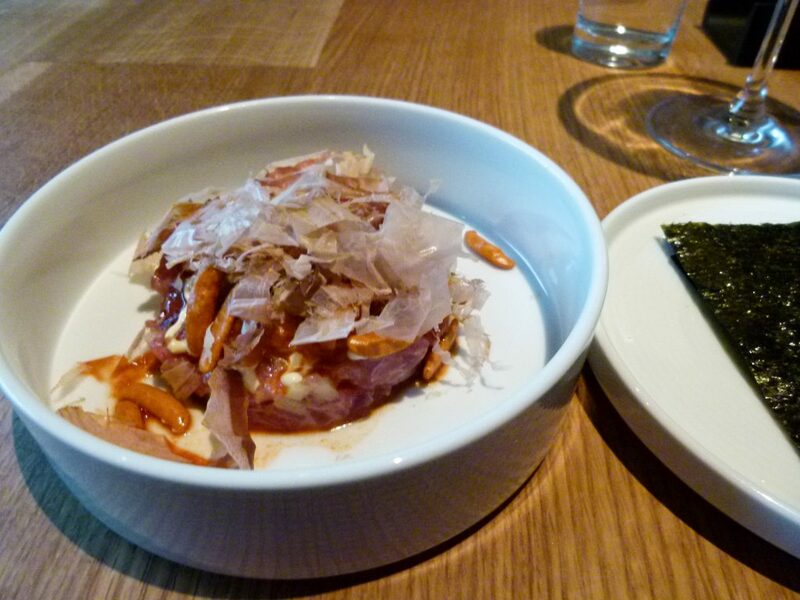 The tartare was prepared with kimchi, miso, and katsuobushi. Nori (Japanese seaweed sheets) accompanied the tartare and I used them to roll mini tartare wraps. The ingredients combined to build a solid wave of Asian flavor. Next the runner brought my beef entree—Chef Sousa says the cuts change sometimes; that’s probably why the menu description is so basic—and the night I was there it was hanger steak. The runner mentioned it was grass-fed beef. It was a succulent sight. The steak was cut into thin slices and the pieces were lined up in a savory row with each slice overlapping slightly on the next. When I ordered the beef the server mentioned that the chef recommends ordering it medium. It looked and tasted just right, a glorious shade of reddish pink in the middle with a nice char on the outside. The steak slices sat upon a bed of chanterelle mushrooms, corn, and greens. The menu listed goat cheese as an ingredient in the dish. Some goat cheeses I like and some I’m not very fond of so I asked for the goat cheese on the side. My fears were assuaged when I tasted it; it was a light flavored goat cheese whip. The corn was a smooth and creamy, slightly sweet preparation. Beef (skirt steak) with the goat cheese on the side. After I finished my entree the server asked if I would like dessert. I asked her what she recommended and she suggested the bread pudding with butternut squash. I had seen this offering on the menu on a previous visit and wasn’t sure if I would like a dessert with squash in it. I decided to try it. 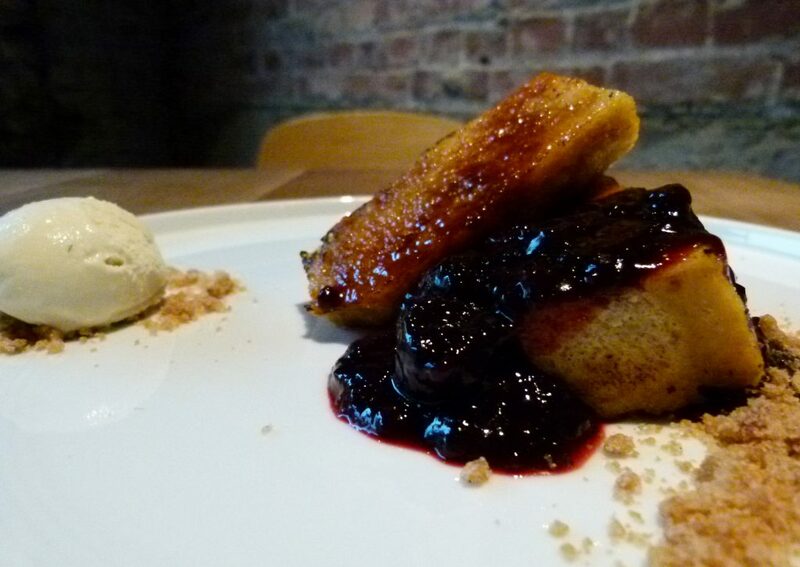 It was a different take on bread pudding, a deconstructed take at that. The dessert consisted of four rectangular bread sticks. It tasted like they were made from a sweet dough, possibly a brioche. The bread sticks had a light glaze and were grilled. There was a nice hint of butternut squash to them. An ample amount of fresh blackberry preserves covered most of the bread sticks, and a small scoop of vanilla ice cream was also on the dessert plate. It was a flavorful and fun dessert with the seeds in the blackberries providing some crunch. I paired my dinner with the restaurant’s tequila cocktail. It was a very good decision. 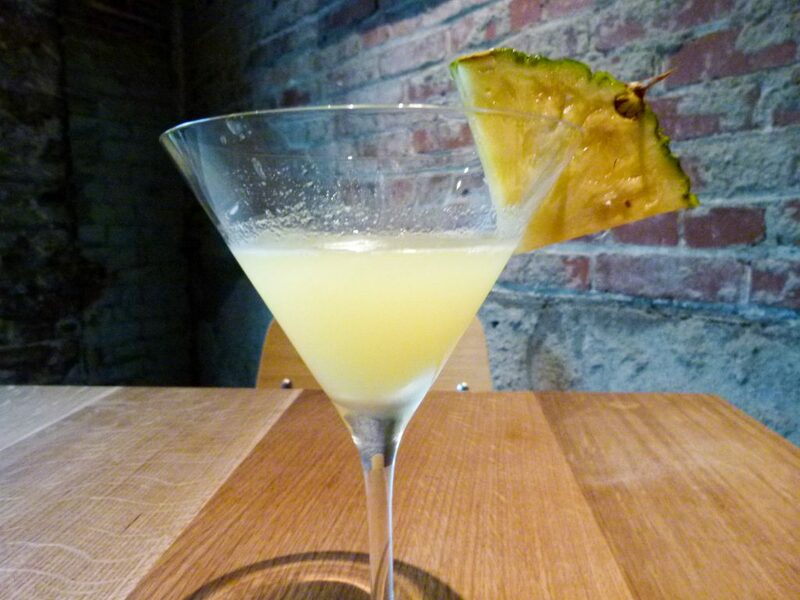 It was triple joy with Espolòn Reposado tequila, pineapple juice, and ginger. The drink hits you with the alcohol of the tequila and then with the blast of ginger and pineapple flavor. The cocktail is served up in a cocktail glass with a fresh slice of pineapple on the rim. There are about 10 featured cocktails on the drink side of the menu. Continental Europe and California are very well represented on the wine list. There’s even a sake section on the list. The beers include local and national craft brews, but it’s also nice to see that one can get a can of Miller High Life for $3. Some local names that can be found among the drinks are Boyd & Blair potato vodka, Maggie’s Farm rum, and East End and 11th Hour beers. Chef Sousa credits Superior Motors General Manager Chris Carter with helping create first-rate bar offerings. 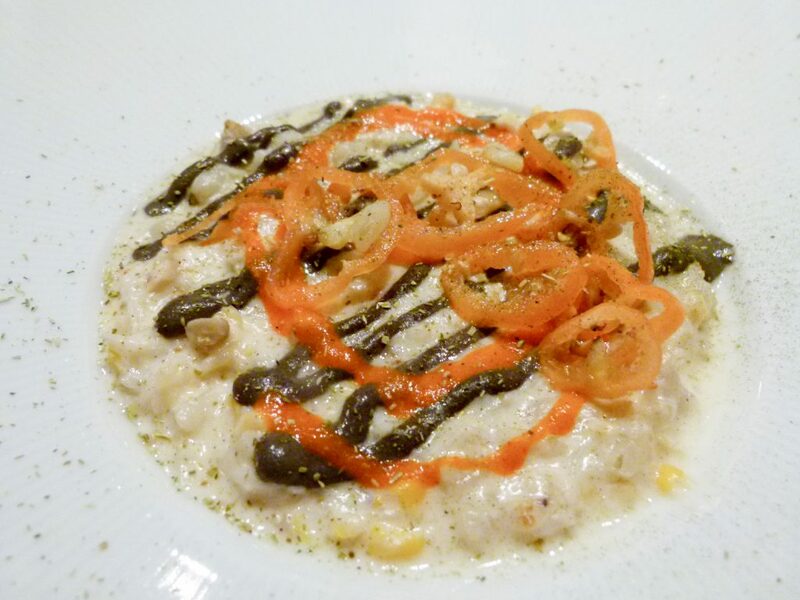 Usually I visit a restaurant twice for a dining review, but some foodie friends with whom I occasionally dine were looking for a restaurant to try. I suggested Superior Motors. My friends had been wanting to visit it, so the eight of us convened there for dinner one recent Wednesday night. I ordered the crab appetizer (a new addition to the menu) and the veal for my main. Again I paired my meal with Superior Motors’ wonderful tequila cocktail. 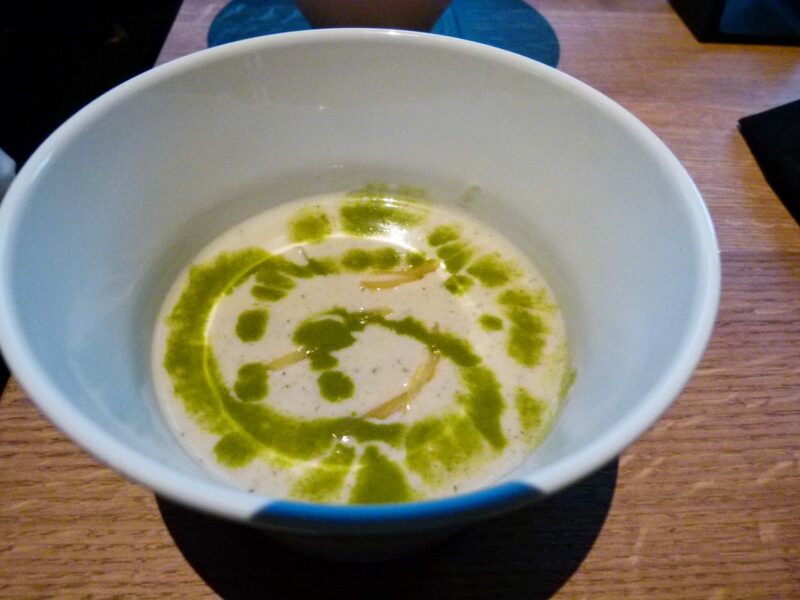 The crab was cooked in a savory white sauce with nixtamal, jalapeño, and huitlacoche. 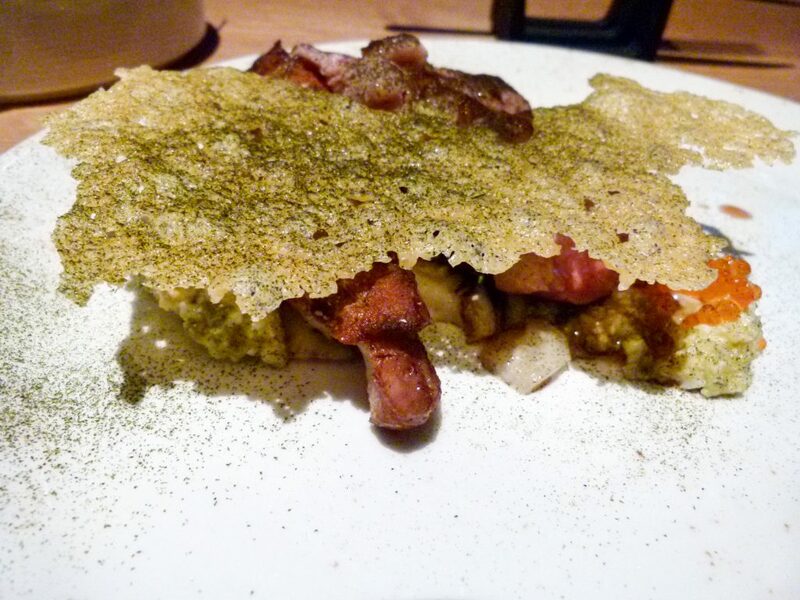 (On my first trip the octopus appetizer featured this seasoning profile and now has a different one). The crab was of good quality, most likely lump crabmeat. Some seasonings were in a gel form and served in decorative patterns on top of the crab. Red jalapeño rings were arranged on top of the seasoning gel. It was a very tasty appetizer. A friend at the table enjoyed hers too. 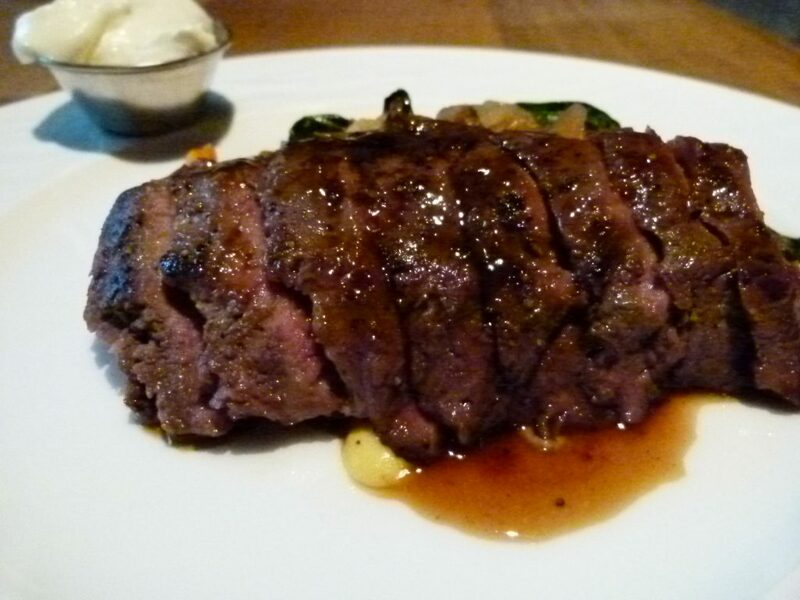 The veal was very flavorful and tender, served in filet strips, similar to the pork I had on a previous visit. 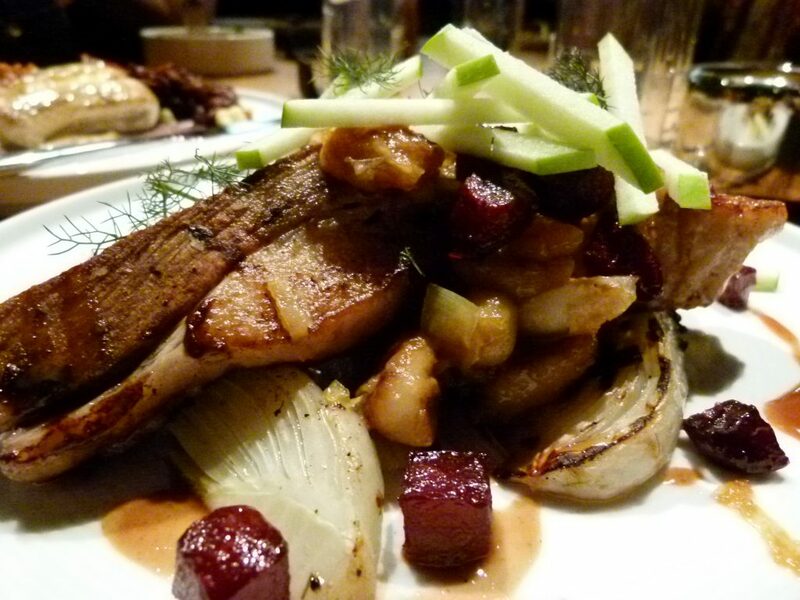 It was accompanied by gnocchi, beets, grilled fennel, and thin strips of apple in a light au jus. The gnocchi were very good. 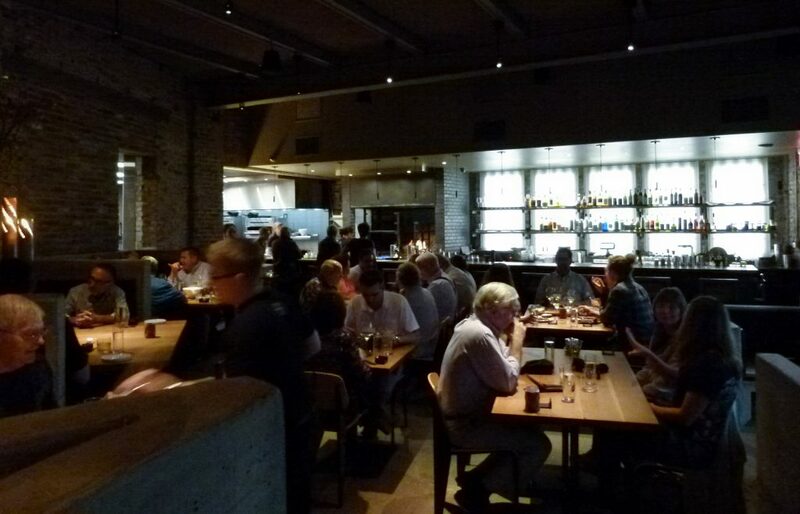 My friends all enjoyed their meals and the service was again friendly and knowledgeable. Prices range from $8 to $21 for appetizers, $18 to $35 for mains, and desserts are all $10. Most signature cocktails are $10. 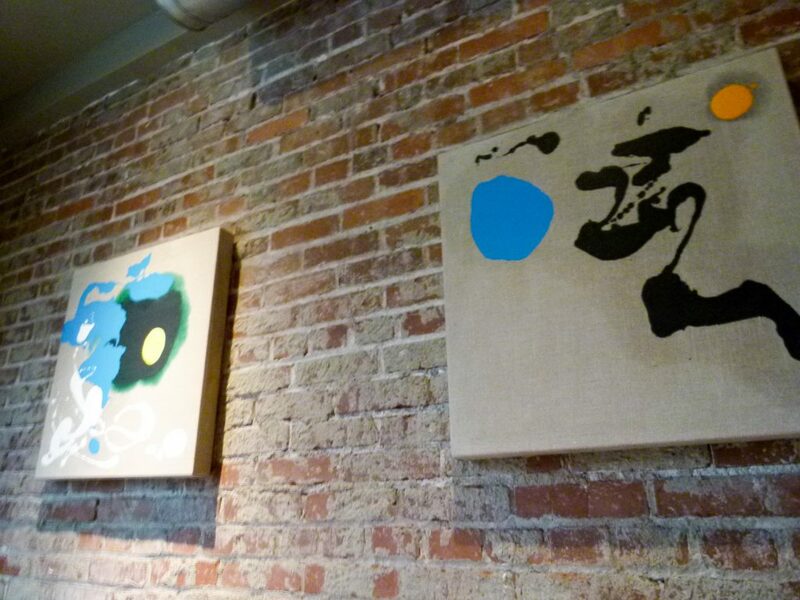 Paintings by Pittsburgh artist Mia Tarducci adorn the walls of the smaller second dining room. Superior Motors opened a small, informal café with lights on strings and picnic tables outside next to the community oven. It’s called Parts and Service because it is near the parts and service entrance of the former car dealership. They had recently started serving pizza made in the oven there. Sousa described the crust as being of moderate size with the dough aged for four days which gives it a sourdough flavor. There are no plans to serve pizza indoors at Superior Motors and the outdoor café is closed until pleasant weather returns again. When I first heard about Chef Sousa opening a new restaurant across from an operating steel plant in Braddock I thought “Wow, that’s a great idea!” I am happy to report that the concept has been executed very well. It is a wonderful blending of the old and new of Pittsburgh in a complementary juxtaposition across Braddock Avenue. It reminds us that we can still respect and enjoy our region’s heritage while exploring new horizons. And that is what Chef Sousa and Superior Motors does; they take you on a fun and delicious culinary adventure. 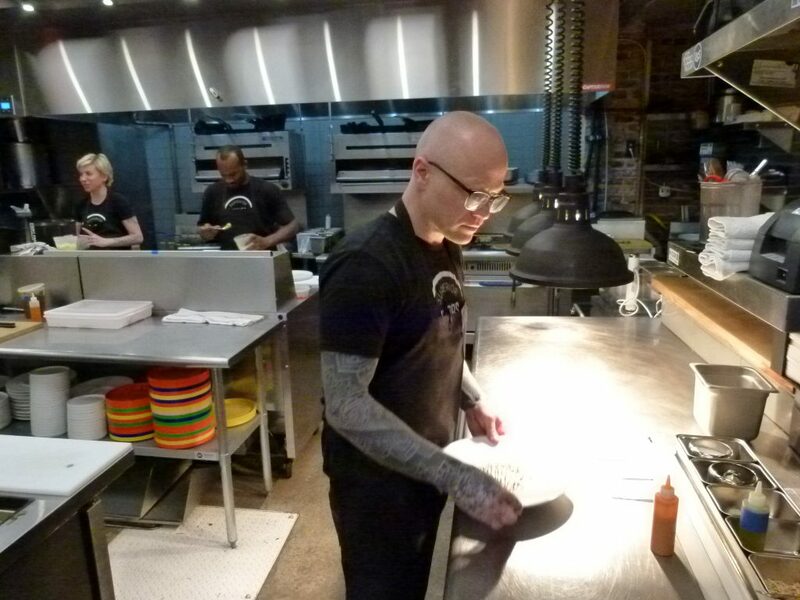 See our story Chef Kevin Sousa’s Road to Braddock. Monday thru Thursday: 5-10 p.m.
Friday and Saturday: 5-11 p.m.
Story and photos by Rick Handler, executive producer of Entertainment Central.